All of our vests come with NIJ Threat Level IIIA Liners. The ADDITIONAL ceramic plates are OPTIONAL (above) and will add coverage to the higher “Threat Level III” rating that includes some rifle bullet protection at the additional cost specified in the pull down menu above. 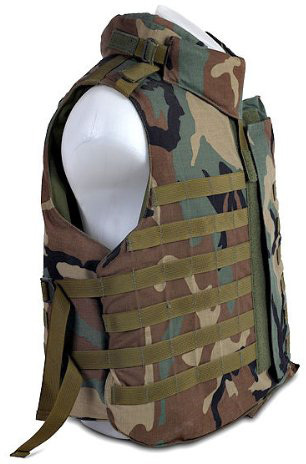 However, the vest itself ALREADY comes with NIJ Threat Level IIIA liners that will stop up to and including 44 Magnum! Top Quality NEW Mil-Spec Body Armor at 7.5 lbs. in Khaki. -Level 3A Bulletproof Protection (NIJ Certified .06). -Front, Back, Side and Neck and Shoulder Protection. 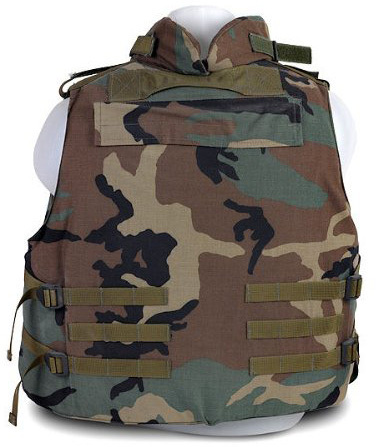 -Made by an official supplier for the military and law enforcement. -Adjustable with Velcro Straps at 4 different points. -Includes a Cordura Carrying Bag. -Specially made Compartments provide the ability to add armor plates for better protection. Please contact us via email if you are interested in upgrading the protection. -Mil-Spec for: Army, Infantry, Special Forces and Special units. – External with pockets for gun and magazines. -Also Level 3A side and neck protection. -Adjustable with Velcro Straps at 6 different points for easy wear and fit under or over any clothing. -Available in a variety of Sizes – From Size S all the way to Size 4XL. Please contact us if you are unsure about the size you need with your height and weight. -Comes with a Cordura Carrying Bag.